Cause this will help the game-watching experience……. August 8, 2014 August 18, 2014 / C.S.G. Introducing the Toyota RED ZONE/DROP ZONE/MURDER ZONE/STROKE-INDUCING ZONE!!! 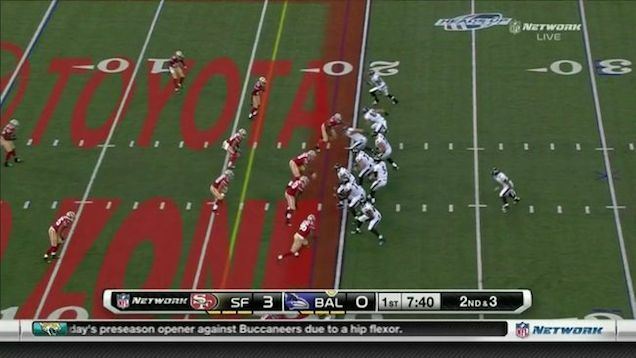 Anyone tuning into the 49ers/Ravens game last night undoubtedly noticed the giant, field sized, red “Toyota Zone” spray-paint lettering on their TV set. Did a 10 year old corporate “Banksy” get a hold of some spray paint in your house?? Nope. The NFL is just being a whore again. Cause nothing says football like huge red corporate sponsorship logos in Cambria font across the 10-yard line. Good news is that this isn’t a forgone conclusion yet, but much like a bad case of herpes, we probably haven’t seen the end of this from the NFL.